"We've been using simulation for 20 year and only in the last year since installing SIGMASOFT have we been able to realize the significant changes to our business. SIGMASOFT is more than just an engineering tool; it’s provento be a complete business tool for us. It heps us to quickly understand very complex problems and find solutions." Servicing the medical, consumer products, business machines, electronic and packaging markets, Tessy Plastics Corporation partners with their customers from the design stage all the way through product completion. Proud of their “Commitment to Innovation,” Tessy is in constant evolution creating an atmosphere of growth and discovery, and uses SIGMASOFT as an important component in keeping their injection molding process on the cutting edge of technology, building and developing customer relationships, and saving time and money while ensuring quality products for its partners. Tessy has used simulation software for more than 20 years. Three years ago they added SIGMASOFT® simulation software as an additional resource, one they now feel has significantly changed the way they do business, enabling them to expand their global presence while finding the most costeffective and high quality manufacturing solutions. Most new projects Tessy acquires are first-time molded products. Joe Raffa, VP and General Manager in charge of sales, says, "With SIGMASOFT onboard, we are able to commit to jobs. I know that when the customer poses new projects to us, I can go to engineering and talk about warp analysis or filling analysis and whether or not a project is even feasible. Once getting that confirmation after running the process virtually, I have the confidence to commit to a project, knowing that the information we received from the simulated run will reflect reality at least 98% of the time." Raffa tells of one situation in which the customer wanted to take new components and marry them to old components for a different look in the end product. Tessy used simulation to investigate the process, and realized the new design would not work. The customer requested a stress and distortion analysis from an engineering company, costing them thousands of dollars, in addition to taking considerable time. Although the engineering company did provide some results and recommendations, the evidence to support these recommendations was not provided. This became the first large project on which Tessy used SIGMASOFT. By simulating multiple processes and cooling times, it was clearly seen at certain points through the process what the issue was. Eric Frearson, Vice President of Engineering, said, "It gave us evidence to show the customer that no amount of cooling changes or process changes had any effect on the problem. It was purely a design change that was needed to fix the problem. The repots provided by the software gave us the credibility and the client the reasurance to make the changes." Raffa added, “It essentially short cut the entire process; we didn’t try running DOEs of all different configurations or measured a ton more parts to chase something that was really not the solution.” Matt Learo, Sales Manager, added, "What's reassuring about this situation was that we hadn’t used SIGMASOFT for very long at this point and the customer was willing to pay for the stress and distortion analysis from the engineering company and see how the results compared. We found the results long before the engineering company did. When we did receive their findings, they were the same. The difference was, we were able to show why it happened and already had a solution to present our customer." "We had an existing customer where the materials they were using were discontinued," Learo said. "The customer called and asked that their new material and new tool be run through SIGMASOFT specifically, to see how the new material was going to behave." Stafford Frearson, Project Engineer expands, "The more complicated a project is and the more complex a configuration might be, when we are not sure how it might warp or how it might fill, there's no question we feel more confident in going to the customer and saying, 'this is what you are going to see', when we have the report backing us up." 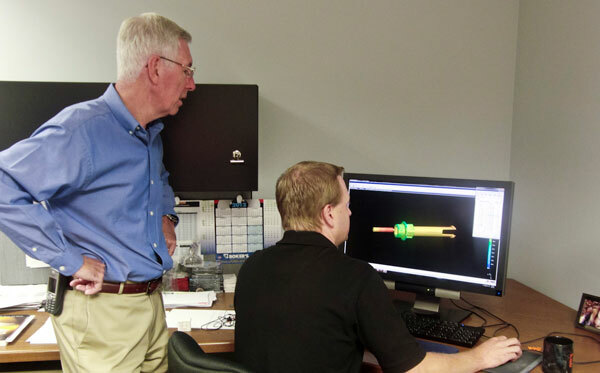 "We use other simulation software, but when the part is complex and on our harder jobs, we always run them through SIGMASOFT," Eric Frearson added. "We have some very complex parts that we manufacture as well as complex molds. Acquiring SIGMASOFT to virtually run the entire mold and process before using production time changed the way we do business. This enables us to understand and find solutions to significant problems that, in some cases, we had been working on for a long time. We are now pointed in the right direction and shown the precise areas we need to focus on to create a solution, thanks to this process optimization software package."